“Utah Is Rad” is a popular hashtag on Instagram. And you know we love a good hashtag on this blog! Bryce Canyon’s rad factor is a 10 out of 10 and while you hear a lot of chatter about Zion or Arches as the big time National Parks in Utah don’t forget about this gem of a place to get rad and adventure around. As always you can check out all of Seth B’s albums as he visits all 60 of the US National Parks HERE. 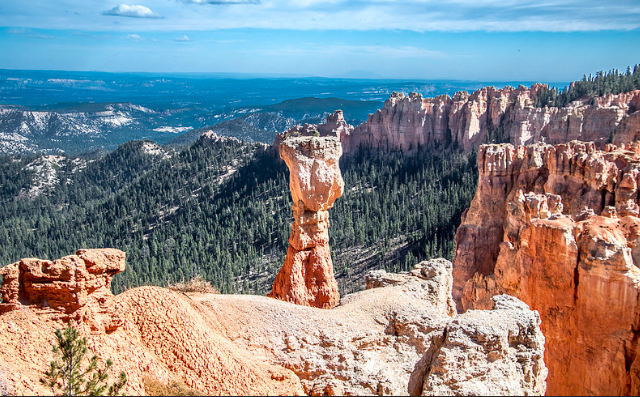 What exactly is a Hoodoo anyway? Well it’s a spiraling pinnacle and it’s the most amazing feature of Bryce Canyon when it comes to what is being photographed and remembered from others visits. The Hoo Doo’s of Bryce Canyon according to the Native Americans, the first and rightful inhabitants of this land, believed that each Hoo Doo was a former Legend person who was frozen into stone by the trickster coyote. I guess he always been a Wily Animal :). No visit to Bryce will occur with a gaping face of awe as you stare out across the open sky to thousands upon thousands of these pinnacles. The rim trail at the park sits between 8,000 and 9,000 feet depending on where you are on the trail so the climate varies. There’s something magical about the snowfall on the hoodoos and a descent down the trail through them, it’s a suggestion we recommend you take very seriously! Peering out into Bryce Canyon from along the rim trail. The first visit to Bryce was not even on purpose. Zion was the trip that was on the mind and as we exited Zion we actually saw a sign for Bryce Canyon NP being less than 60 miles away. There was no plan to even go there but that’s the beauty of a road trip that is not 100% filled. Next Stop (Unexpectedly): Bryce Canyon National Park! There are plenty of small random diners, picnic pullovers, or Utah Ranch experiences in between Zion and Bryce. You could easily tack on a few days exploring the rugged terrains that separate the parks. The park is small enough to feel as though you can really see all of it in a short period of time but big enough that you won’t be exploring the only overlook with everyone else. The Lodge at Bryce Canyon fills up quickly with the only lodging inside of the park but there are plenty of camp sites as well; just be careful that no coyotes try to pull any tricks on you if you sleep on the ground! There are several well maintained and longer hiking trails in the park for the true adventurer. The Rim Trail will take you around the, you guessed it, rim of Bryce Canyon and gives you several angles to admire and relish in the spirit of the hoodoo’s. The Navajo Loop and Queens Garden Trails will take you through a wide variety of the canyon and give you enough elevation to sweat but enough breaks that you’ll have a day of hiking available to you the next day! However it’s a park to not be missed and to not just be thrown in with the others of Utah. Bryce has its own beauty, history, adventure, and stories that deserve your undivided attention for a period of time. If you offer Bryce Canyon National Park this it will give you more than you could ever imagine in return. Thanks for reading, what’s your favorite Utah hiking trail? Comment below!